Determining the correct placement of dental implants, bridges, crowns, etc. In order to have accurate readings of your mouth, rely on Galileos 3D CT Scans utilized by Dr. Yankowskas from Tyngsboro Cosmetic Dentistry! For more questions about how a Galileos 3D CT Scans can benefit your smile call Dr. Yankowskas in Tyngsboro, MA at 978-649-7773 or visit www.tyngsborocosmeticdentist.com. Dr. Yankowskas accepts patients from Tyngsboro, Townsend, Westford, Hudscon, Pepperell, Pelham, and surrounding areas. If you are looking for a simpler way to fill in missing teeth space then dental bridges are perfect for you. 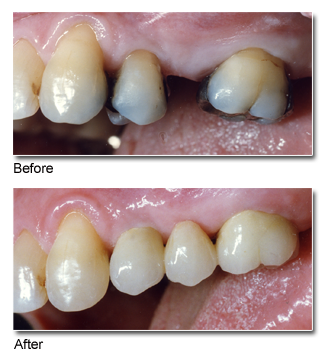 A bridge is a customized to fit the gaps in between your missing teeth for a more natural and enhanced smile. Teeth that are cemented to dental bridges are called abutments and serve to anchor the bridge in place. A replacement tooth called the pontic is then added to the crowns and inserted to cover the abutments, resulting in the dental bridge. Dr. Yankowskas emphasizes that with the proper oral hygiene and dental care, dental bridges can last up to twenty years. Patients have the option of choosing their preferred material used for the dental bridge. These materials include porcelain and ceramic. If you are not a hundred percent sure on what type of material would be best for your dental bridges, Dr. Yankowskas will refer the most efficient material based on the location of your bridge. With the help of Dr. Yankowskas you can go through and dental bridge procedure and gain a radiating smile that will not only change the way you look, but change the way you feel. For more questions about dental bridges or to make an appointment, call Dr. Yankowskas in Tyngsboro, MA at (978)649-7773 or visit www.tyngsborocosmeticdentist.com. Dr. Yankowskas proudly serves Tyngsboro, Westford, Hudscon, Pepperell, Pelham, and surrounding areas.